Coloring Book and Crayon Set: A Fun Pack! Make it Easy with the coloring book conveniently packaged with a 4-pack of crayons in a sealed poly bag. No assembly required. All kids love a visit to the fire station! Seeing heroes in action up close and personal is every child’s dream. Now they can, with the A Visit to the Fire Station coloring and activity book. With scenes from real firehouses, your kids will have a blast and learn about Fire Safety with 16 pages of coloring, games and activities honoring this noble profession. 5 alarms of fun! Recommended for children ages 3 and up. Ideal for firehouses and fire departments, schools and children’s educational programs. 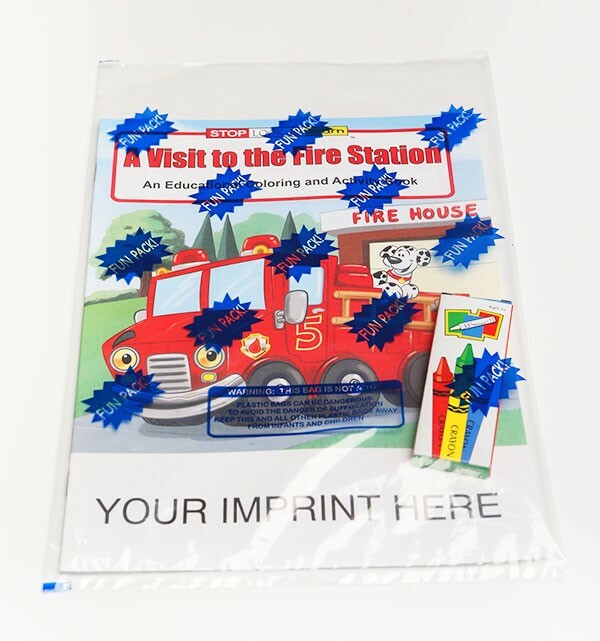 Price includes a one color imprint in standard imprint color (Black, PMS 186 Red, PMS 286 Blue or PMS 355 Green) on coloring book.